Widely regarded as Voyager’s best season, Season 4 opens with the exciting conclusion of “Scorpion,” which introduces us to a new character, Seven of Nine, who will be featured prominently throughout the remainder of the series’ run. With the addition of a major character also sees the departure of Kes in the season’s second episode, “The Gift.” Kes returns in the Season 6 episode “Fury,” but her absence is otherwise barely noticed. Voyager strikes an uneasy partnership with the Borg to fend of Species 8472's invasion. As Voyager limps out of Borg space, Kes undergoes a dramatic transformation and a unique new member joins the crew. Chakotay finds himself fighting someone else's war against his will. 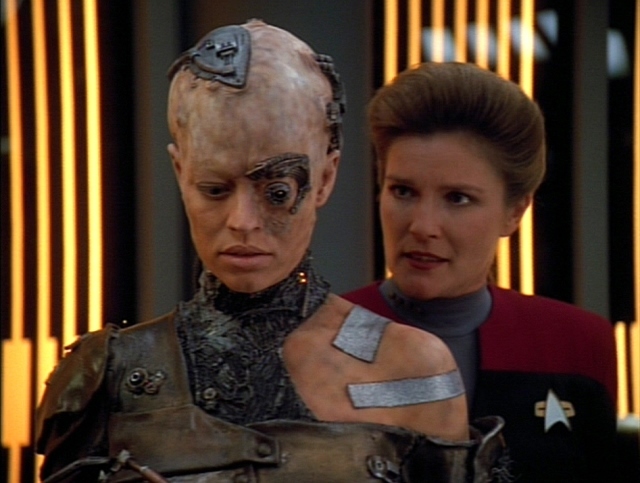 Voyager encounters a disturbed, vengeful hologram while Seven senses Kim's infatuation. Seven discovers that Voyager's crew are subjects of secret deadly experiments. When Voyager seeks to recover stolen supplies, Janeway receives help from the holographic version of Leonardo da Vinci, who is using The Doctor’s pirated mobile emitter. When Neelix returns from death, his spiritual beliefs are put in doubt. An unknown species attacks Voyager's crew through their dreams. Voyager rescues a Hirogen who underestimated his prey. Chakotay becomes involved with a mysterious woman who seeks asylum on-board Voyager. In the distant future, The Doctor’s backup program is reactivated, who must now correct Voyager’s negative historical perception. In desperate search for deuterium, Voyager lands on a “Demon” class planet after Paris and Kim go missing on its hostile surface.